Another day, another year end “Top 10” list! This time around we look at my favorite collected editions of vintage material published in the past year, “vintage” in this case being work originally produced prior to the year 2000. Eurocomics and Manga are both eligible here, as well, as long as they first saw print prior to all our computers failing, the electrical grid going dark, the food supply collapsing, and civilization falling apart on December 31st, 1999. Remember those crazy times? 10. Brat Pack By Rick Veitch (IDW) – Arguably the last great work of super-hero revisionism prior to Jeff Lemire and Dean Ormston’s Black Hammer, Veitch’s bleak and unforgiving look at the teen sidekicks of Slumburg is as shocking, ugly, and mean-spirited as ever — not to mention gorgeously illustrated. IDW pulled out all the stops with this one, loading it up with “behind-the-scenes” bonus material that all crusty aficionados of this rank, but spot-on, unpleasantness will surely find illuminating and engrossing. I still feel like I need to take a shower after reading this book to get the stain off — and yes, I mean that as a compliment. 9. Death Stand And Other Stories (The EC Artists’ Library Vol. 22) By Jack Davis And Harvey Kurtzman (Fantagraphics) – The harrowing reality of combat stress has arguably never been rendered in comics with more authenticity than in these classic EC strips illustrated by Davis and (largely) written by Kurtzman. Even people who think they probably don’t like war comics owe it to themselves to give this collection a shot and see what they’ve been missing out on all these years. 8. New Gods By Jack Kirby (DC) – This one probably deserves to be ranked higher purely on its merits, as many of the very best of Kirby’s Fourth World stories are in here, but considering that all of it was included in last year’s Fourth World Omnibus, this really just represents an essential purchase for absolute completists, or anyone who took a pass on the omnibus for budgetary or storage space (hey, it really is a beast!) reasons. Some of the finest comics ever made by anyone are found on these pages, though, so it earns a spot on the list even though it comes hot on the heels of a larger, more comprehensive collection. 7. Jim Osborne : The Black Prince Of The Underground Edited By Patrick Rosenkranz (Fantagraphics Underground) – Far and away the most disturbing book on this list, Osborne was probably the most grotesque and unsavory of the “first wave” of underground cartoonists — as well as one of the most talented, producing work so rich in detail and meticulous in its execution that it still literally boggles the mind. 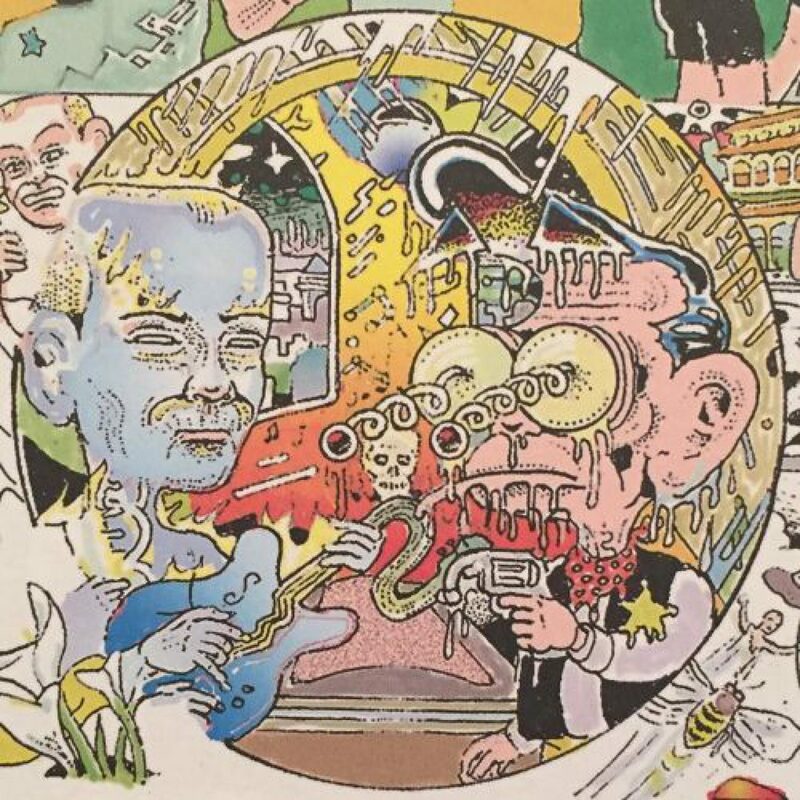 Editor Rosenkranz deserves tremendous credit for collecting all of this less-than-prolific artist’s work between two covers, and Dennis Dread’s detailed biographical sketch of Osborne’s troubled life is a terrific piece of comics scholarship. Not for all tastes and sensibilities to be sure — but if your “wiring” is as off-kilter as mine, this is an essential purchase. 6. Corto Maltese : The Golden House Of Samarkand By Hugo Pratt (IDW/Euro Comics) – One of Pratt’s finest and most ambitious Corto stories finally gets the deluxe treatment that has been lavished on the character’s previous adventures. If you’re a fan, that’s cause for celebration, and if you’re not — well, now’s the perfect time to become one! European genre comics simply don’t get any better than this. 5. best of witzend Edited By Bill Pearson And J. Michael Catron (Fantagraphics) – Anyone who couldn’t fork over the cash for the complete witzend slipcase collection a few years back will be overjoyed to find this well-curated collection of the finest strips to appear in Wally Wood’s legendary “pro-‘zine,” as editors Pearson and Catron present groundbreaking cartooning from artists that truly “run the gamut,” including Bernie Wrightson, Reed Crandall, Gray Morrow, Howard Chaykin, Walter Simonson, Jim Steranko, P. Craig Russell, Art Spiegelman, Steve Ditko, Vaughn Bode — and, of course, Wood himself. A superb selection that will leave your head spinning and that, crucially, “ports over” the exhaustive historical essay work presented in the earlier, larger publication. 4. Master Race And Other Stories (The EC Artists’ Library Vol. 21) By Bernard Krigstein (Fantagraphics) – The premier visual innovator in comics history, Krigstein’s astonishing work finally gets a truly deluxe presentation in this painstakingly-restored collection. The scope and grandeur of Krigstein’s imagination still positively boggles the mind, and its fruits have never looked better than they do in this sumptuous volume. 3. Love That Bunch By Aline Kominsky-Crumb (Drawn+Quarterly) – Okay, yeah, some of the material in this comprehensive retrospective came along after the year 2000, but the vast majority predates it, and it would be absolutely criminal not to find a list to include this on. I’ve always preferred Aline’s work to that of her more-famous husband, and these largely-autobiographical strips will probably go some way toward winning over even the most understandably reactionary fans who reflexively eschew anything with the “Crumb” name attached to it. I’m not here to judge how and why she can survive a marriage to one of the most talented-but-unsavory people in comics, only to state that her own work stands on its own merits and communicates a positive, empowering message in endearingly neurotic and self-deprecating fashion. I do, indeed, love that — meh, too obvious, right? Just buy the book, you’ll never regret it. 2. Kamandi Omnibus By Jack Kirby (DC) – Finally! The amazing adventures of the last boy on earth get the “omnibus treatment,” and the result — while hefty both physically and financially — is nothing less than magic. One of Kirby’s absolute best comics ever, this is also one of the most imaginative, rip-roaring, and just plain fun works in the entire history of the medium. Nothing short of comic book perfection. 1. Dirty Plotte : The Complete Julie Doucet By Julie Doucet (Drawn+Quarterly) – Pioneering feminist auteur Doucet finally gets her due with this beautiful, two-volume hardcover slipcase collection that features all of her work from her legendary Dirty Plotte series, as well as a good chunk of material that was published before and since, a wide-ranging interview with the artist, and essays of appreciation from top cartooning talents. This was one of the formative works of the 1990s that helped blaze a trail for any number of women cartoonists, and is every bit as powerful, authentic, idiosyncratic, and funny now as it ever was. Doucet is, simply put, one of the most outstanding talents to ever draw breath. Here’s all the evidence would could possibly need to buttress that assertion. And that’s four lists down, with two yet to come! Next up : the top 10 “special mentions” of the year, an eclectic category of “comics-adjacent” work that includes no actual comics per se, but narrative works (illustrated or otherwise) either by cartoonists, or about comics. It’ll make much more sense when I post it (probably tomorrow), I promise! Are you broke from buying this stuff yet? I am!